Recently, I played with PnP TerrainCreator (www.pnp-terraincreator.com). It worked very well, and the documentation and plug-in reference is very detailed. So, I created a plugin for exporting to DXStudio’s mesh format ‘*dxmesh’. It uses Worldweaver’s DXMeshAPI 1.0.1 and is mainly based on the plugin reference code by the TerrainCreator people. This exporter is adapting the programming layout of the pnpTC plugin demos (and re-using quite a lot of their code). Creating quads from heightmap bits, exporting textures, lightmaps and reducing polygons is in. Plus some additional features that might be helpful for using the meshes with DXStudio. There is a chance the plugin will be added to the official pnpTC distribution some time in future. Until this might happen, please download from this site. Place the file PnPTCDXStudioFileHMapExportPlugIn.dll into pnpTC’s plugin folder, e.g. C:\Programme\PnP TerrainCreator\PlugIns and DXMeshAPI.dll into the main application folder, e.g. C:\Programme\PnP TerrainCreator. On Startup, pnpTC should detect the new plugin. Do *not* place the DXMeshAPI.dll into the plugin folder of pnpTC. This would cause an error message on startup. These links to pnpTC wiki entries: Graphics and Game Engines and DXStudio. The compiled plugin v1.4 and DXStudio helper dll 'DXMeshAPI.dll'. pnpTC_terrain_test.zip 5/9/2009 2.3 MB A DXStudio document (zipped *.dxstudio), using a 4x4 tiled terrain (dxmesh, exported with the plugin).For DXStudio 3.0.29 and up. pnpTC_terrain_test.exe.zip 5/9/2009 15.8 MB A DXStudio document including the DXStudio installer, using a 4x4 tiled terrain (dxmesh, exported with the plugin). pnpTC_terrain_Tiles_4x4.zip 5/9/2009 2.0 MB A exported test terrain. 4x4=16 tiles, lightmap. This is the one used in the demos above. L3DT by Bundysoft is a nice application for the generation of large 3D terrains (L3DT = Large 3D Terrains). 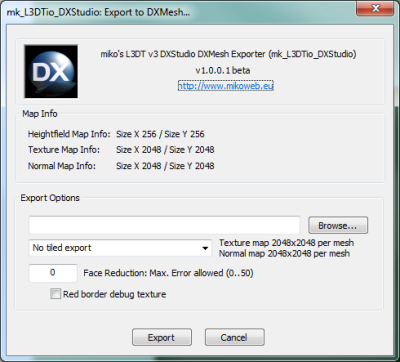 This is a L3DT plugin to export to DXStudio’s mesh format ‘*dxmesh’. It uses Worldweaver’s DXMeshAPI 1.0.1 and Bundysoft’s Zeolite API 11.08. The current plugin version works with L3DT version 11.08 and up. Minor bugfixes. The compiled 'plugin mk_L3DTio_DXStudio.zeo', DXStudio helper dll 'DXMeshAPI.dll' and documentation pdf. The compiled 'plugin mk_L3DTio_DXStudio.zeo', DXStudio helper dll 'DXMeshAPI.dll' and documentation pdf.